A while back, my cousin, Pattie, shared a recipe for chocolate sheet cake with me that our Grandma Davis had written in her own hand, and allowed me to scan it so I could keep a copy for myself. (Thank you, Pattie!) This is precious to me, because my Grandma was and is precious to me, I love to bake, especially cake, recipes are precious to me, and this one is doubly so because it was written and used by her. However, I don’t think I will ever make it as written. I have had this old-fashioned chocolate sheet cake before (not baked by Grandma, but the same recipe), and I was not impressed with the lack of chocolate flavor, and thought it wasn’t quite moist enough. I hate to say it, but it was, in fact, the worst homemade cake I’ve ever had. Not that it was a terrible gag-worthy cake, it just wasn’t as good as all the others I’ve had. Yes, my name is Veronica, and despite liking cake mixes, I am a cake snob. I won’t even touch a store-bought cake (gag) unless I’m at a party where it’s being served, and I’ll take a slice so as not to offend. But don’t you dare try to buy me one for my birthday. I require that cakes have great flavor, great texture, delicious homemade frosting (preferably made with real butter), and be very moist. This cake met none of those requirements, although the icing was almost good enough. When I ran across Paula Deen’s recipe for Savannah Sheet Cake on From Apples to Zucchini recently, I could tell right away that it would be more moist, sweeter, and more chocolatey than Grandma’s recipe. I combined that recipe with my Grandma’s directions for baking, and switched the regular cocoa powder with Dutch process to make it even more chocolatey. I’m pleased to report that this cake is everything I hoped it would be: insanely moist and perfectly chocolatey. It’s so good, I’m thinking of using the cake recipe to make a layer cake and seeing if it is as good as my favorite chocolate cake. And I’m not sure how I know this, but when served warm with a scoop of vanilla ice cream, it is sheet cake nirvana. Preheat oven to 400 degrees F. Grease and flour an 18″ x 12″ jelly roll pan. In a small saucepan, combine water, butter, oil, and cocoa. Bring the mixture to a boil; remove from heat. Stir together the flour, sugar, salt and baking soda in a large bowl. Beat in the eggs, sour cream and cocoa mixture. Add the vanilla. Mix until very smooth, about 2 minutes. Pour the batter into the prepared pan. Bake for 15 minutes, until the center appears firm and the cake has begun to pull away from the sides of the pan. Five minutes before the cake is done, start the icing. Bring the butter, cocoa, and milk to a boil in a medium saucepan; remove from heat. Stir in the sugar and beat with an electric mixer until smooth, about a minute. Stir in the vanilla and pecans. Pour warm icing over warm cake and spread quickly with a spatula. Let cool about 2 hours before cutting. Laugh after reading that and dig right in, topping the warm piece with ice cream and let your eyes roll back in your head as you take your first bite. *To toast pecans, place on a microwave-safe plate and microwave in 30-second intervals, stirring in between, until nuts are toasted and fragrant, about 1-2 minutes. Posted in Cake & Frosting and tagged best, chocolate sheet cake, Grandma's, savannah, super, texas. Bookmark the permalink. I love the oleo….totally reminds me of my grandma. She didn’t cook and bake, but I remember her distinctly calling any type of butter or spread, oleo margarine…. The cake looks wonderful! Paula does know her desserts! What a triumph of a cake! I’m sure your grandma would be pleased that you took her cake to new levels. I think your Grandma would be proud! That cake looks very moist and yummy. My Grandma says oleo too, funny how that word sticks with them through all the changing times. I love how picky you are about your cakes! I have a friend who is just the opposite, she LOVES store bought cakes which is weird because I’m with you, I’d much rather have this cake! It looks awesome! I love the look of this old fashioned cake..something I would bake and take to my co-workers or a friends birthday. I loved the hand written recipe by your lovely grandma….I wish I had my grandma.. Thank you for sharing with us the recipe and cake….love u! Moist chocolate cake is one of my favorite things on the planet. This looks so utterly perfect. I’m afraid to make it…..I know I’d eat it all. I actually like grocery store birthday cakes. :) They make me really happy. Chocolate pecan icing? Ohmygoodness. That sounds amaaaaazing! Sorry about Grandma’s cake but I’m in love with Paula Deen’s cake. Looks amazing! Sounds like you came up with the perfect cake recipe! 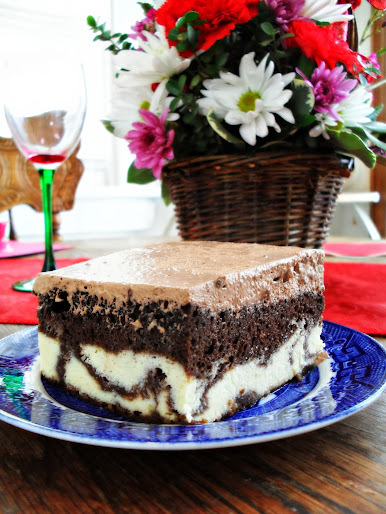 I love how fudgy and rich it looks…it’s time for breakfast but I’m totally craving chocolate cake, lol! Your version looks amazing… definitely moist and flavorful! Dry cake is a crime. Sometimes grandmas really mean well…but sometimes their food needs an update. And you updated to heaven-status. Pecans and chocolate… who could go wrong? My sister just got ahold of our mon=ms recipe box and i am quite ticked off that she had complete control of it and wont give me any of the recipes, because she doesn’t want them blogged. Now why would she be so greedy so as to not want them shared? I think just the opposite of her and would love to have people see what i grew up with…..
OK, here’s what you do: ask her to meet you somewhere for lunch. Instead, go to her house while she’s gone and photograph all the recipes in the box. She’ll never know you have them! It’s sneaky, but not mean like she’s being. You deserve to have those recipes just as much as she. Thank you for stopping by my blog! You are the first person I have met online who mentioned they also bake for the state fair. I only live about 20 miles away from the entrance gate so I don’t freeze anything. Of course that means I go nuts for two days before the entries are due. This will be the first time I have entered chocolate chip cookies. I wish I would’ve looked at the winners last year! I usually end up making less than I register for because I just run out of energy. Thank you also for the information on the cookie scoop. I refrigerate my cookie dough, sometimes overnight, so I don’t know if the cookie scoop would work so well. The dough is stiff. However, I won’t spend too much on one to see how it works. It’s the refrigerated dough that kept breaking the cookie scoops I got from the cake supply store. The one I got from Walmart is really sturdy and I think it would hold up to refrigerated dough. Oh , and one more thing. If you make the delicious-looking frosting above again, try using salted butter. I’ll bet it will be even better! If that’s possible of course! Good point–I always use a little salt in chocolate icing b/c it really benefits from it! Just didn’t think about it here. I just looked at your favorite chocolate cake and my mouth is drooling!!! Your friends and family are lucky to have you to bake for them!!! This chocolate cake looks very moist. I wished I had a slice right now :) Yummy!!! This cake looks amazing and I need a piece now! What is Oleo? is it butter? DiAnn, Oleomargarine was the name given to a substance, by the creater, who trying to make an alternative to butter. It’s a combo from the sounds of the fatty acids he used. Oleo stuck as a nickname. Margarine stuck as a “trade” name. I didn’t think anything could beat my grandmother’s Texas Sheet Cake. Until this. To quote one of my kids: “This tastes weirdly good.” Yup. Perfection. Just baked my second one of the week to carry to a birthday dinner. Can’t wait to try more of your recipes.